With the addition of the simple device here illustrated, any match box can be converted into one of the self- feeding type. A piece of tin, or cardboard, is cut, as shown at A, the exact size depending on the match box used. The piece cut out is folded on the dotted lines, the cover on the match box is removed, and the part B pushed into the end of the box beneath the matches. 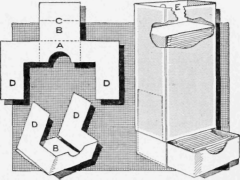 The part B is twice as long as the depth of the box, therefore it enters the box as far as the line C. The flaps D rest against the outside of the box, and are held in place by the box cover. The matches feed into the box formed of the tin or cardboard as fast as used, while the burnt ones can be placed in the upper part E.